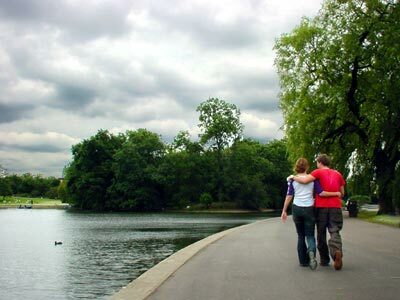 A couple walk along the banks of the large boating lake in Regent's Park on a Saturday afternoon. Five seater rowing boats can be hired, while a nearby boating pond caters for children. Bright yellow kid's pedal boats can be hired - but only if the child has "legs over 70 cms long"!